Original equipment manufacturers (OEMs) have been aggressively downsizing engines to meet strict fuel-economy and emissions standards without sacrificing power and torque. Most new engines today use some combination of turbochargers, direct-fuel injection and variable valve timing to make more power than their larger counterparts while delivering improved fuel economy. This scenario seems like all up-side for drivers. But today’s smaller, hotter-running engines pose significant challenges to lubricants. The latest is a phenomenon called low-speed pre-ignition (LSPI), which can destroy pistons and connecting rods. As its name implies, LSPI is the spontaneous ignition of the fuel/air mixture prior to spark-triggered ignition. It’s another version of pre-ignition, which has been around since engines were invented. In this case, though, it occurs under low-speed, high-torque conditions in turbocharged gasoline-direct-injected (TGDI) engines and is much more destructive than typical pre-ignition. In a properly operating engine, spark-triggered ignition typically occurs a few degrees before the piston reaches top dead center (TDC). This careful timing ensures the downward force of the exploding fuel/air mixture works in tandem with downward piston momentum, resulting in optimum engine efficiency and power. LSPI effectively throws off engine timing. In turbocharged engines operating under certain conditions, particularly at low speeds and under high torque, like when taking off from a stoplight, the fuel/air can spontaneously ignite too early in the combustion cycle. The expanding combustion charge collides with the piston as it’s still moving up the cylinder. The collision between the exploding combustion charge and the upward-moving piston can destroy the pistons or connecting rods. Current thinking suggests the cause is due in part to oil/fuel droplets or particles in the cylinder auto-igniting randomly. The droplets/particles heat enough to ignite the air/fuel mixture before the spark plug ignites. This means oil formulation can play a role in reducing LSPI. Testing has shown that certain motor oil components can promote LSPI, while others can help quench it. Even the formulation of gasoline plays a role; however, it’s easier to solve the problem by reformulating motor oil. Oil formulators face a difficult balancing act. It’s no easy task figuring out how to formulate a motor oil that delivers excellent wear protection, resists the increased heat of turbocharged engines, prevents deposits, acts as a hydraulic fluid and, now, combats LSPI. The important thing to keep in mind is that it is the performance of the total formulation that counts, not just the quantity of one or two motor oil components. Difficult or not, fighting LSPI must be done. Next-generation oils will need to pass an LSPI test to meet the new API SP and ILSAC GF-6 performance specifications set to take effect in mid-2019. General Motors is ahead of the game and requires oils to pass their own LSPI test to meet its updated GM dexos1 specification (known as dexos1:2015) scheduled to take effect Aug. 31, 2017. For now, you don’t have to worry too much. Your vehicle’s computer is programmed to avoid operating conditions that lead to LSPI. However, operating your engine under those conditions does promise fuel economy gains, so once oils hit the market that combat LSPI, you can bet the OEMs will program their vehicles to benefit from those efficiency gains. We’re hard at work reformulating Signature Series Synthetic Motor Oil, XL Synthetic Motor Oil and OE Synthetic Motor Oil in preparation for the new engine challenges addressed by the new specifications. After months of vigorous testing, the results are in: AMSOIL synthetic motor oil provided 100 percent protection against LSPI in the engine test required for the GM dexos1 Gen 2 specification, proving it can protect turbocharged direct-injected engines. 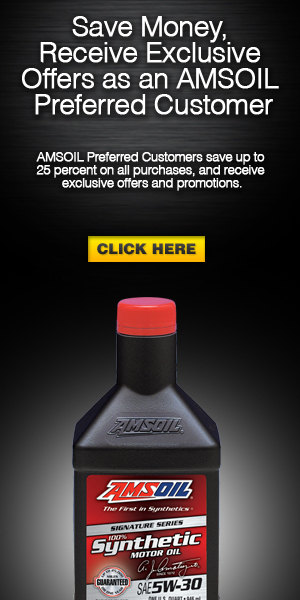 The complete line of AMSOIL synthetic motor oils will be upgraded to meet these challenges. Stay tuned.